In my July 16 column, I explained what to do when you’re bitten by a tick. 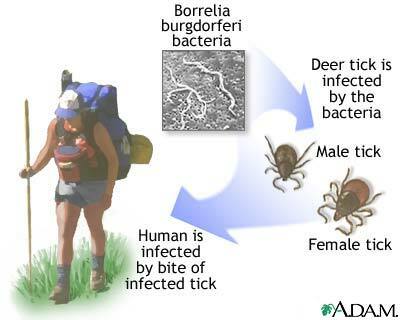 Today, I will describe the symptoms of Lyme disease, which is carried by some ticks. Quite often, after an obvious tick bite, a red rash may develop at the site of the bite within the first 24 to 48 hours. A rash that develops this quickly after the bite is usually an allergic reaction to the saliva of the tick. It rarely grows beyond 2 inches, needs no treatment and disappears within a few days. The actual Lyme’s rash, called erythema migrans, is reported to occur in up to 80 percent of infected tick bites. Some would argue that it occurs less often. It is described as a red rash that is usually neither itchy nor painful. It develops a few days to a few weeks after a tick bite and is likely to be the first sign of Lyme disease. The rash most often continues to get larger over a period of time and will grow to be well over 2 inches, possibly 8 to 12 inches or more, and may last for several weeks. This rash may sometimes develop a pale appearance in the center, causing a bull’s eye shape, but this does not happen consistently enough to be a sure sign of Lyme disease. The rash and the above flu-like symptoms are considered early Lyme disease. When treated properly during this stage, most infections are completely cured. Treatment for late Lyme disease involves months of heavy duty antibiotics with no guarantee of a complete cure. Over the years of my practice, I have come to realize what a difficult and incompletely understood disease Lyme is. It is difficult to diagnose, because a significant number of those with Lyme disease don’t even recall being bitten by a tick. “Typical” symptoms may actually be very atypical or not present at all. Laboratory tests are not as accurate as we would like, and there is disagreement as to which tests are best. There is also controversy as to the most effective treatment for early and late Lyme disease. There are “Lyme specialists” whose opinions vary greatly and whose treatment may seem excessive compared with traditional practitioners. I personally follow the more traditional route, but because I feel that we don’t yet have all the answers on Lyme disease, I am open to “non-traditional” therapy as long as it seems to have good results and causes no harm. Research continues to improve the best treatment for this disease. The bottom line is that whether you are aware of a recent tick bite or not, if you develop an unusual, unexplainable rash or if you develop flu-like symptoms, especially outside of the flu season, you should visit your doctor and discuss the possibility of Lyme disease.